April is Parenting Awareness Month Indiana (PAMI) is an annual statewide public education and awareness initiative of the Responsible Parenting Campaign (RPC) that calls attention to the need for effective and responsible parenting, parenting education, and supportive resources to help families thrive. 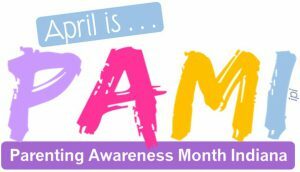 PAMI accomplishes this through celebration, that is, by acknowledging and paying tribute to people raising children throughout Indiana for the entire month of April. Businesses, schools, churches, organizations, and state and local agencies collaborate to acknowledge the vital role parents play in raising children to become productive citizens of our communities and society. Via parenting celebrations and workshops on current parenting issues, the community is able to inspire and support parents in the demanding task of raising the next generation of future leaders. Provide resources that help to preserve, protect, and advance the well-being of Hoosier children and families. If you are interested in promoting PAMI in your place of business (i.e., retail, community center, church, community agency, etc. ), please Contact Us.